Dark Horse Comics published the first issue in the Star Wars: Tales of the Jedi - The Freedon Nadd Uprising series of comics. The 24-page comic book is one of two issues, which were later adapted into audio form, which follows the stories of two Jedi Knights called Ulic Qel-Droma and Nomi Sunrider in the Old Republic era. The story takes places on the planet Onderon, which was later used in canon during season five of Star Wars: The Clone Wars. Onderon is described as a world "long-divided into warring tribes" following the death of the ruling monarch. The world is split between a group of Onderonians who still worship the memory of a dark Jedi who ruled the planet centuries earlier (called Freedon Nadd) and the supporter of Queen Galia's reign. 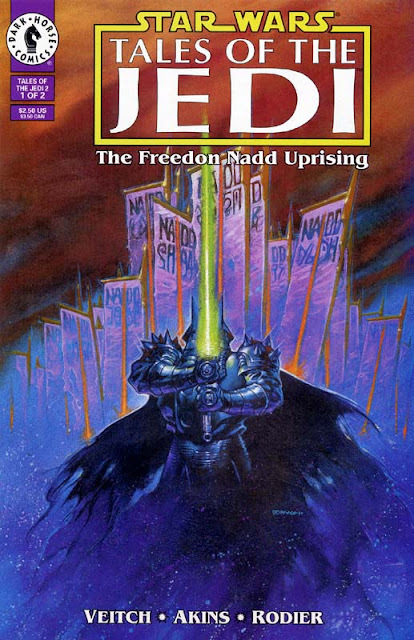 The second issue of The Freedon Nadd Uprising series was published later that year in September. Who remembers reading this comic series? Which comic book series was your favorite in the 1990s? Let us know your thoughts in the comments below.